A group of us scratchboard artists are working through the process of establishing ISSA, International Society of Scratchboard Artists. 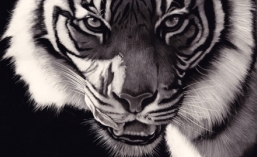 The goals are to drive scratchboard into greater recognition as the fine art medium that it is, and to provide exhibitions and workshops around the world for scratchboard artists to show their work and to increase their education in the medium. There are many of us out there, thousands possibly, and there isn’t any entity representing us – until soon. Watch this space over the coming months for more information so if you wish to try your hand at scratchboard, there will soon be a good support system in place. Love to participate. Learning knew methods from other artists. Wonderful work. Indeed to be considered fine art. Patrick, I’ll look forward to this. I’ve been doing a few miniature pieces in scratch. My wrists complain when I do the large ones, but I’ve been able to do the miniatures. I love doing scratch work. Miss doing the larger pieces.